Researcher: Basivi Radhakrishna and Frederic Fabry, Department of Atmospheric and Oceanic Sciences, McGill University, Montreal, Quebec, Canada; John J. Braun and Teresa van Hove, Constellation Observing System for Meteorology, Ionosphere, and Climate Program Office, UCAR, Boulder, Colorado. A network of ground-based GPS stations measures atmospheric water vapor over the continental United States with effective spatial and temporal resolution. GPS data consistently tracks annual and seasonal moisture transport from the Gulf of Mexico into the Great Plains and the moisture variability related to the North American monsoon. 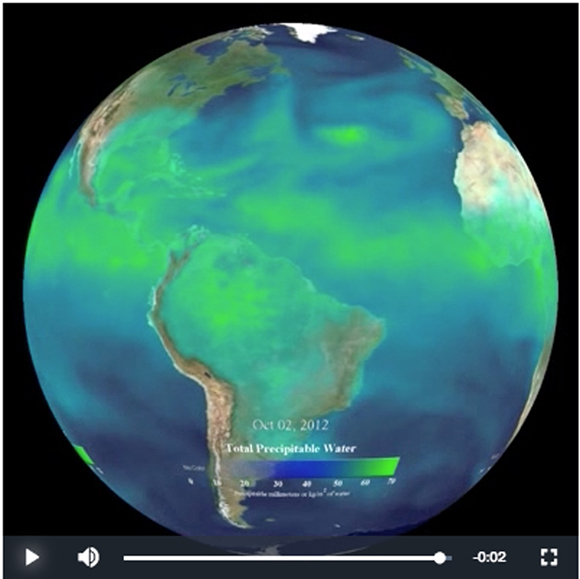 Diurnal variations in moisture from GPS are different from models and other measurements, indicating that daily cycles of precipitable water vapor (PW) and precipitation are coupled in different ways in different regions. GPS measurements can be used to forecast convection up to 3 hours before it starts and these measurements are valuable for severe weather forecasts. Atmospheric water vapor fuels storms and affects longer term climatological processes. Measuring this elusive property is difficult. Current tools include radiosondes and ground- and space-based radiometers. Radiosondes are very accurate but are limited in space and time, while radiometers are limited by rain or by clouds. 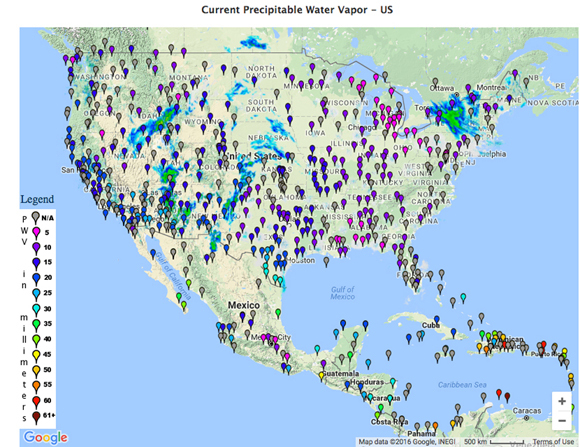 A network of 503 GPS stations in and around the continental United States provide improved spatial and temporal coverage of moisture above the surface. The network provides about 8 times more spatial measurements than radiosondes and 24 times more temporal measurements. The primary network is called SuomiNet and includes stations from the National Oceanic and Atmospheric Administration, the U.S. Coast Guard and Army Corps of Engineers, and UNAVCO’s Plate Boundary Observatory. GPS mapping of water vapor is completed for a 4-year period to look at diurnal, seasonal and annual variations. The GPS results are compared to the North American Regional Reanalysis (NARR). 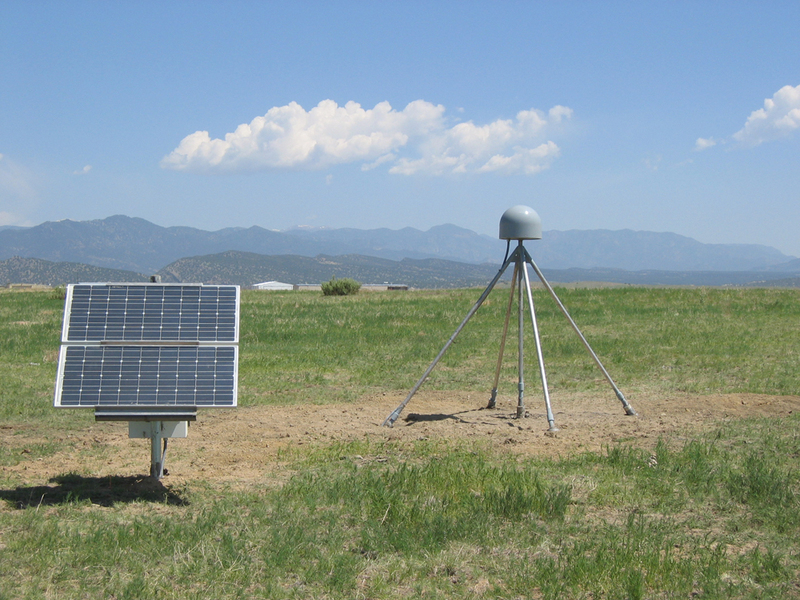 NARR includes twice-daily moisture measurements, primarily from radiosondes. Over monthly and annual periods the PW correlates between GPS and NARR. Over daily timescales, the measured PW from GPS does not match the NARR over the Rocky Mountains. The data comparison makes it clear that the NARR is unable to capture daily changes in moisture. The GPS data indicates that PW and precipitation are correlated in time and space over the Great Plains and the eastern U.S., but are not correlated over the Rocky Mountains. The GPS PW data is very useful for forecasting the initiation of convection, which signals a coming storm, up to 3 hours before the severe weather forms. B. Radhakrishna, F. Fabry, J. Braun and T. Van Hove, Precipitable Water from GPS over the Continental United States: Diurnal Cycle, Journal of Climate, April 2015, doi:10.1175/JCLI-D-14-00366.1.